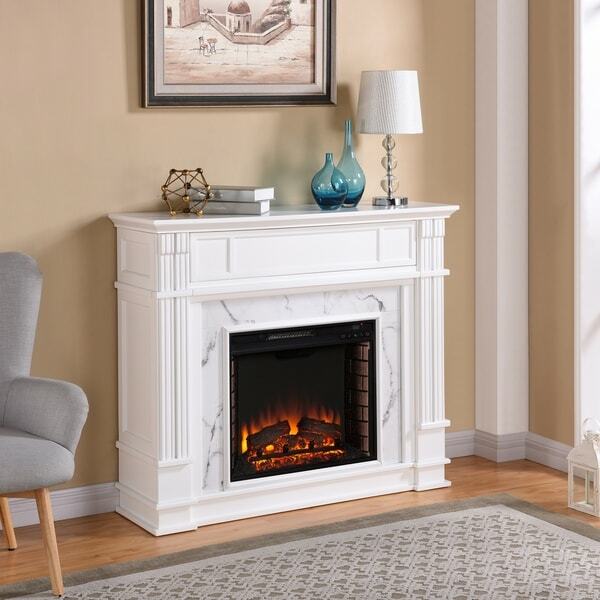 Warm up your contemporary space with this cozy, faux-marble fireplace. The all-white engineered wood and veneer frame is accented with smooth faux marble, and a safe tempered glass front. Create your perfect fire by adjusting the flames, logs, and thermostat with the included remote control. This fireplace is everything I hope it would it’s clean sophisticated look is a great addition to any room. Assembly took about an hour and half for two people. Could be done by one person but easier with two people. Only tool needed is a screw driver. We ordered the Faux Cararra Marble Electric Media Fireplace a month ago and we absolutely love it! We have been using it every day and it keeps our living room warm enough not to use any additional source of heating. It is a bit noisy though. Assemble was easy + 1h30mn. The brick wall inside and the faux cararra marble outside make it look very nice and elegant. The different lights and the media storage cabinet are also extremely convenient. 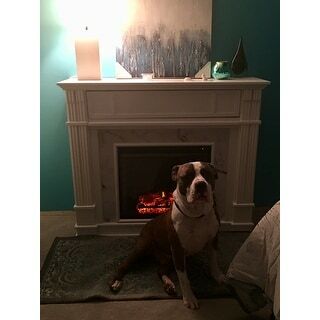 I highly recommend this fireplace! Best purchase ever! To give you an idea about how expensive people think it is, let me share a brief anecdote. One of my friends had been over pre-fireplace. When I showed him a picture, he thought it was like a late attachment that was added to the house lol. Though that sounds silly, he couldn't believe I built it, much less that I had purchased it from Overstock lol. The assembly was not hard at all. I'm a 27 y.o. female and assembled it in under 2 hours with little assembly experience. As the title of the review states, I only rated it lower because of the lack of tools. I was missing 3 of the curricular, tightening screws. I also had a few things left over, which I found quite odd. Regardless, I kept going and was so happy I did! Visually, it adds such a subtle elegance and sense of coziness: normally, those two adjectives are mutually exclusive. Practically speaking, I'm so glad I bought this fireplace because we just recently had snow in our city for the first time in 13 years, so it kept our house warm. Coupled with this heater and the snow, it is turning out to be a beautiful first Christmas season in our new home. :) P.S.- It was definitely the best Black Friday purchase this year! I'm so glad I left it in my cart for a couple of weeks- I saved so much money! I was itching to get it for the holidays. Hard to do but worth it! LOOK FOR COUPONS ON RETAILMENOT TO KNOCK OFF A FEW BUCKS! Really love the look of this in our bedroom! Love that I can use with or without heat as well as change the flames, logs and backlighting. The only thing that I was not too happy about is the joints don’t match up perfect in the corners and the front door doesn’t move really smoothly. It is substantial. A great look for our living area. the marble looks great and the fire looks exceptional for an electric fireplace. No mess and supplies heat! So glad we made this purchase. Based on other reviews, we elected for this model. The marble look did not disappoint! It is laminate, not rock or tile, yet it looks great! We are really pleased at how classy it looks. The white mantle and surround are well constructed, and add to the look. The fireplace insert has a fabulous firelog 3D effect that really looks real! We assembled the fireplace in 2 hrs and there were enough parts supplied to put it together correctly. Our whole family enjoyed curling up with books in front of the fireplace the very first night we had it assembled. What a joy! Beautiful and sturdy. Shipment was extremely fast. The instructions were very clear and all the hardware to put it together were there. I love the top door to stash the XBox and DVD player. It came in 2 boxes, I was able to put it together by myself in about an hour. (30 yr old female). There is a temperature setting and a timer you can set. You can also change the brightness of the "glowing" logs and the height of the fire. The only reason I didn't give 5 stars is because you cannot feel the heat from it unless you are about 3 feet away or less. This fireplace looks very modern. Got several compliments. Looks better in person then in pictures! Would recommend this to anyone who's looking for a modern fireplace! Took over a week to arrive. Half the package got lost in transit. They wouldn’t expedite the second package replacement. Took 3 phone calls, 4 chats, and countless time with UPS. 9 days since I ordered and I’m now just waiting for my replacement to be processed. Estimated complete arrival 3 weeks from order date. Overstock is the worst. ..... sells an almost exact model, buy from there instead. 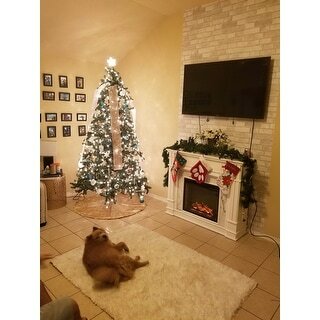 The fireplace looks amazing. It does a good job of heating small spaces as well. I also used the light feature at Christmas time next to my tree which was gorgeous. The only reason I didn't give 5 stars is because the door on the mantle doesn't quite align right and sometimes gets jammed. Other than that it is excellent and I would recommend it. Love it!! Looks beautiful and is exactly what I wanted. My only problem with it is when assembling it not all of the corners match up perfectly leaving spaces. A few defective parts but Overstock customer service is awesome! "Does this have to be mounted on the wall? I want it in front of an outlet. 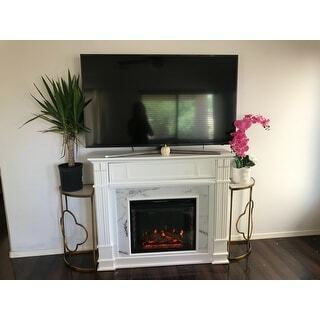 The instructions don't have any text, just pictures..."
This fireplace is not a wall mounted unit, it is free standing. "Can this hold a tv?" The instructions say anything under 85 lbs. "Can you remove the logs and fill the inside with candles instead?"